After a 2-month-long hiatus, I am glad to announce that Makeup Piggy is back! :D I am finally done with my qualifying exam, and will resume posting reviews and tutorial for you guys. Also of note is that I now have 700+ followers, even though I have been missing for so long. To all the new followers, welcome! And to everyone that has been following me, thank you very much; you are what keeps me motivated in posting in Makeup Piggy. Anyway, let's start with some long-overdue reviews! This is Neo Cosmos 3-Tone/Glamour Grey, sponsored by Shoppingholics. I cannot tell you how ridiculously in love I am with these lenses! 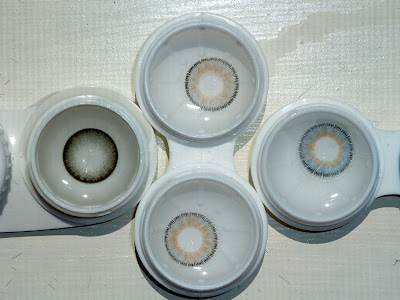 They are just so perfect, and exactly what I am looking for in a natural-yet-striking design for colored lenses. The Glamour Grey looks wonderful in all lighting, and covers my eyes' original colors really well. The delicately printed design, with the jagged outer ring and light brown inner ring, makes the lenses look very natural. Such a natural look in mass-produced colored contacts is rare, usually you have to look for custom-painted lenses which costs at least a hundred dollars. The enlargement is minimal for the Glamor series, but I actually feel that if the lenses enlarge too much it would ruin the realistic effect. Some of you might have noted that the Glamor Greys look a bit blue. Here are the lenses compared with the actually blue variety from the same series (which I reviewed here). 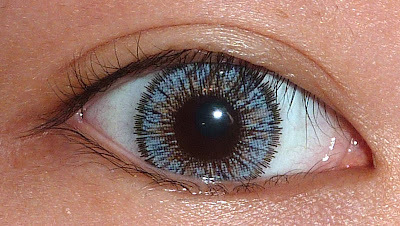 The blue lenses are darker and brighter blue when you put them next to the grey. Here are all the lenses used in this review. Clockwise from the top: Glamour Grey right side up, Glamour blue, Glamour Grey upside down, Dali Extra Grey. Comfort: 10/10 - No discomfort at all, but the lenses are a bit thin and require careful handling. OVERALL: 10/10 - This time's overall score is not an average, but my general impression of the lenses instead. I just love love love these lenses, and I will definitely buy another pair when these expire! Those lenses do look very awesome~! 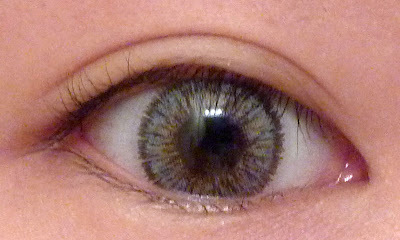 I love lenses with brown-yellowish inner rings to help blend into natural eye colours but I'm not really liking the jagged outer ring on these ones ^^"
Can you recommend me any other lenses that are somewhat similar without the jagged edges?? Oh and also, what's the size of these lenses? Hurrah! You're back. C: Congrats on finishing those exams~. And on your skin tone, the Glamours look so pretty! They. Are. So. Beautiful! Thank you for the pictures! 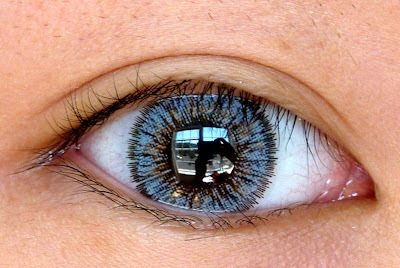 These are definitely my next coloured contact lenses! wow! love those lens! looks very nice on your dark eyes! i tried this one.but was a lil uncomfort. the most comfortable lense for me is puffy. i think i hv kinda sensitive eyes.